This website provides information about scholarships, universities, and recommended courses for students from Myanmar (Burma) who aspire to study at a university abroad. Chat anonymously with Student Support – Click the link below (Note: You will need to have Skype installed on your computer). Take a look at the latest scholarships available for Burmese students, along with news and important information. To finance students or short-term groups from the countries along the Belt and Road with established joint study projects or agreements with SWU. Ø Type A Scholarship covers registration and tuition fees (including experiment and internship expenses), comprehensive medical insurance and monthly living allowance (CNY1100 for Bachelor’s degree students and visiting students; CNY1400 for Master’s degree students and CNY1700 for Doctoral degree students). Ø Type B Scholarship covers registration and tuition fees (including experiment and internship expenses) and comprehensive medical insurance. The deadline will be decided on a changing basis, advise to check University website regularly. To finance outstanding students from countries within the Belt and Road Initiative to pursue studies in Zhejiang University of Science and Technology(ZUST) offers ‘Silk Road’ Chinese Government Scholarship for undergraduate programs. Please submit the documents to International Student Admission Office(411, west wing of Library)Zhejiang University of Science and Technology, or send your application documents to one of the emails as follows. The application for the 2020-2021 is open now. *All candidates are strongly encouraged to apply online. To apply online, please register on the portal and then follow instructions. Please download the application form before completing or printing, and review the accompanying materials before submitting your application. RWTH Aachen University is proud to offer a scholarship to support Master’s Studies at TGGS. The second year of the program is to be spent as a research stay at RWTH Aachen University. The scholarship is financed by the German Academic Exchange Service (DAAD) and the German Federal Foreign Office. TGGS was founded as a joint project between DAAD, RWTH Aachen and King Mongkut‘s University of Technology North Bangkok (KMUTNB). Students from South-East Asian countries (not including Thailand) with a Bachelor’s Degree in Engineering, an excellent academic record and good English skills. The selection process is highly competitive and will include interviews conducted in May 2019. Application Deadline 19th April 2019. Chinese Government Scholarship-Silk Road Program is a full scholarship established by Ministry of Education to support Chinese universities to attract outstanding international students from Belt and Road Countries for studying in China. China Three Gorges University (CTGU) is one of the prestigious universities designated to undertake this program to recruit students for studying the following two majors. Application Time: January to April 30th, 2019. Walailak University International College (WUIC) offers full and partial Tuition Waiver Scholarships for the admission of students with excellent academic records. The scholarship scheme is for students to study for their 4-year Bachelor’s Degree in the following international programs, starting from the 1st semester, Academic Year 2019 (August 2019 – May 2020). The deadline for the applications for scholarship is on 10th May 2019. The application for Yunnan Provincial Government Scholarship 2019 has already started. Priority will be given to the applicants who come from Southeast Asian and South Asian countries. Application deadline: April 10th, 2019. Please post the completed application form to Yunnan Normal University together with other documents required (in duplicates) before April 15th, 2019. 298, Dec.1st Street, Kunming, China. for ASEAN and GMS Countries’ Personnel of Academic Year 2019. Application deadline: April 5, 2019. An applicant must be a university student or graduate whose age is not over 30 years old on the camp final date, 1st July 2019 and able to communicate well in English. The application is opened from now until 31st March 2019, 11:59 PM (Thailand time). Young professionals interested in coming to the U.S. for a one month professional fellowship! The application for the Fall 2019 program in Economic Empowerment is open now. Applications are open for the 2019 Wells Mountain Foundation scholarship program. Wells Mountain Foundation scholarship program awards 20-40 scholarships per year. Maximum scholarship is $3,000 USD per year. Changchun University of Science and Technology(CUST) recruit outstanding international students for the “Belt and Road” Scholarship program. Applicants should apply to CUST between early January and June 20th. Under the mandate of the MOE, Zhejiang University is calling applications for “Chinese Government Scholarship – Chinese University Program” of Zhejiang University for the year 2019. Applications Deadline: March 31, 2019. Agency No. of Zhejiang University is 10335. The TaiwanICDF provides each scholarship recipient with a full scholarship, including return airfare, housing, tuition and credit fees, insurance, textbook costs and a monthly allowance. The application period: from January 1 to March 15, 2019. For detailed information on such documents, please refer to the International Higher Education Scholarship Program Brochure. The Office of the Higher Education Commission (OHEC), Ministry of Education, Thailand, in cooperation with Thai universities invites nationals of Cambodia, Laos, and Myanmar to apply for Thailand Scholarships for academic year 2019. Up to 37 scholarships will be granted to students and faculty members of higher education institutions or general public in Cambodia, Laos, and Myanmar to further their master’s degree or doctoral degree study in Thailand in international programmes offered by Thai higher education institutions. Tuition fees, living allowances and accommodation, travel, textbooks, as well as health and accident insurance expenses will be supported by Thai higher education institutions and OHEC. Applicants are requested to submit the original set of application forms and required documents to the Royal Thai Embassy in Phnom Penh, Royal Thai Embassy in Vientiane, or Royal Thai Embassy in Yangon. Please mark “Thailand Scholarships” at the bottom right corner of the application package. 2) The contact person of the 2 selected universities as appeared in the attached programme table for initial reference. Application deadline: both the original and electronic copies must be received no later than Monday, 25 February 2019. It is offered the students who apply to study Master’s Degree or Doctoral Degree in Jiamusi University. The Chinese Government Scholarships include the tuition, lodging, stipend and comprehensive medical insurance. The deadline for application is March 30th, 2019. The School of Applied Statistics, National Institute of Development Administration (NIDA) is now offering Full Scholarships to qualified applicants who want to pursue for Ph.D. in Computer Science and Information Systems at the school. Apply Now Until April 5, 2019 for August Semester, 2019. The new ISE Scholarship is now available on offer for Foreign Students at International School of Engineering (ISE) for the year 2019. The scholarship covers full tuition fees of the programme for students with excellent academic performance. Applications Deadline: February 15, 2019. More details of the scholarship programme, click below. Amount of full entry scholarship is up to an annual amount of HKD200,000 (about USD 25,000) for 4 years, covering tuition fees, student accommodation fees and living expenses. The application opens on 12 September 2018 and will close on 15 March 2019. For more details on the scholarship, programme and application methods, please the fact sheet click below. It is one of the programs of Chinese Government Scholarship (CSC scholarship) and assigned from Ministry of Education to the university to recruit outstanding international students. Applicants need to submit the application materials according to school requirements. HIT will admit the best applicants by selection and recommend to the China Scholarship Council. Applicants, who are recommended for the CSC scholarship, will receive a confirmation E-mail from HIT in April, and then complete the follow-up application according to the E-mail instructions. Applicants should post their application materials in time to the College of International Education of HIT from September 20 to December 31, 2018. Note: The date of receiving paper materials will be regarded as the date of application. Please mark clearly “CSC Scholarship Application” on the envelope. The Chulalongkorn University has established a “Scholarship Program for ASEAN Countries” to provide academic assistance to international students from Cambodia, Indonesia, Laos, Malaysia, Myanmar, Philippines, Singapore, Brunei, and Vietnam to pursue their studies at Chulalongkorn University at graduate level. Application deadline: November 15, 2018. ** The application date and selection schedule of the applicants has set by each of the faculty/program. The applicants should send the application form and relevant documents to the faculty/program at least 2 weeks before the University deadline. RGJ-ASEAN provides students with full scholarship to pursue Ph.D. study in Thailand. Students from ASEAN countries (Indonesia, Malaysia, Philippines, Singapore, Vietnam, Myanmar, Cambodia, Laos, and Brunei) can also apply for a full RGJ scholarship to pursue full-time doctoral studies in Thailand. More details of the scholarship programme, please click below. Young professionals interested in coming to the U.S. for a one-month professional fellowship! Applications for YSEALI Professional Fellowships in Spring 2019 are now open! Applications are open until Nov. 16, 2018. The UWC Scholarship is available for Myanmar applicants for studies starting from the Academic Year 2019-2020 and the application is now open! Deadline for submitting the complete application package: 11th January 2019. 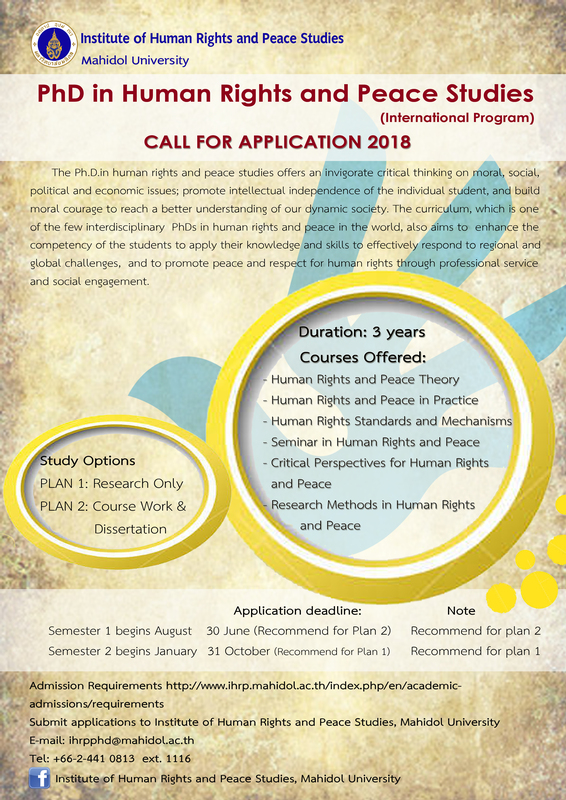 The Institute of Human Rights and Peace Studies(IHRP), Mahidol University and the Dignity Institute, Denmark invite qualified applications for two PhD scholarships for Myanmar students within the field of human rights and detention. Application deadline: July 25th 2018. For further information contact Principal Investigator Andrew M. Jefferson amj@dignityinstitute.dk or Ms.
Pannapa (Gift) at ihrpphd@mahidol.ac.th at IHRP, Mahidol University. Application deadline: June 11, 2018. The Walailak University is inviting applications for Undergraduate Excellent Scholarships for students to study for their 4-year Bachelor’s Degree starting from the Academic Year 2018 (August 2018 – July 2019). Costs? No registration or participation fee. The organisers will cover accommodation and meals for the duration of the conference, plus a travel subsidy from your country of residence to the starting point and back. The ASEAN Scholarships for Myanmar is tenable for 4 years leading to the award of the Singapore-Cambridge General Certificate of Education Advanced Level (GCE A-Level) (or equivalent) certificate. The Scholarship is for studies in selected Singapore schools from Secondary 3 to Pre- University 2 and is renewed annually, subject to the satisfactory performance of the scholar. Application period: 2 April 2018 (10.00am ) to 25 May 2018 (10.00pm ) Myanmar Time. Please submit your application online via the online application system. The Yanshan University Scholarships are awarded to master degree candidates for the academic year 2018-2019. These scholarship is valid for 3 years (can be extended to 4 years if 1 year of Chinese language learning is needed). Most courses are instructed in Chinese. Application Deadline: May 20 2018. Two letters of recommendation from professors or associated professors. The Central South University (CSU) is inviting applications for full scholarship for Non-Chinese students to study in China. English Language Requirements: For English-taught programs, TOEFL 85 or IELTS 6.0 (received within two years) is required. Following situations can be given exemption: a native speaker of English or the previous degree was fully taught in English. > Transcript of HSK4 for Chinese-taught majors and IELTS\TOFEL or any other English proficiency certificates for English-taught majors. > A statement for not funded by other types of scholarship. Sichuan Agricultural University offers three kinds of scholarship to the international students: Sichuan Government Scholarship (SGS), Sichuan Agricultural University Scholarship for Outstanding International Students (SAUSO) and Sichuan Agricultural University Scholarship for Chinese Studies (SAUSC). The Scholarship is mostly open to both the degree programs (undergraduates and graduates) and the non-degree programs (the visiting/exchange students and Chinese language students). The scholarships cover full or some items of tuition, living allowance, medical insurance, basic textbooks, etc. The Sichuan Agricultural University (SAU) is offering scholarships for outstanding international students for 2018. The scholarships are open to students who are applying for the admission or who are studying in the bachelor, master or doctoral degrees programs of Sichuan Agricultural University. Applicants shall visit the Admissions Page of SAU International Office: http://english.sicau.edu.cn/?p=6 and read carefully the Admission Information. Submit Scholarship Application in the online system http://113.54.15.22/, upload Scholarship Application Form and other application documents in the online system as required, send the documents to the International Office after all the information submitted is verified. (mail address is enclosed in the item Contact Information). Scholarship recipients will be notified by the university before June 30th. The YSEALI Professional Fellows Program gives participants ages 25-35 the opportunity to spend five weeks in the United States, where they will work in a full-time placement in a U.S. business, NGO or government office. During these placements, Fellows build their practical expertise, leadership skills, and professional networks. The application for the Economic Empowerment Cohort of YSEALI PFP is open from February 19 – March 30, 2018 at https://ais.americancouncils.org/pfp. Results for the semi-finalist round will be announced by email in mid-May. The Fall 2018 Fellows will be in the U.S. from October to November 2018. 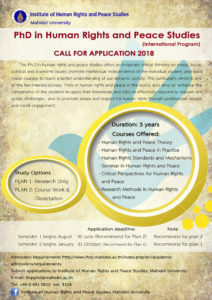 The Master of Arts in Asia-Pacific Studies Program (MAPS) at College of Interdisciplinary Studies, Thammasat University is offering fully funded scholarships. 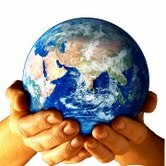 Currently, there are two types of scholarship available for International students and one for Thai students. Please mail the completed application and all required documents to MAPS Administration Office. If you have any questions, please feel free to ask by phone or email. The Civil Society Leadership Awards (CSLA) provides fully-funded scholarships for master’s degree study to individuals who clearly demonstrate academic and professional excellence and a deep commitment to leading positive social change in their communities. Applications deadline: May 15th, 2018. All candidates are strongly encouraged to apply online if possible using Submittable, an online platform. To apply online, please register on Submittable and then follow instructions. Please download the application form in Word before completing or printing, and review the accompanying materials before submitting your application. RWTH Aachen University is proud to offer a full scholarships to study Master’s program in Engineering at TGGS. The scholarship is financed by German Academic Exchange Service ( DAAD) and the German Federal Foreign Office. TGGS was founded as a joint project between DAAD, RWTH Aachen and King Mongkut’s University of Technology North Bangkok (KMUTNB). Students from South East Asian Countries ( Not included Thailand) are Eligible to apply. DAAD- SEARCA scholarship for Southeast Asian Regional Center for Graduate Study and Research in Agriculture is inviting applications for In-Country/In-Region Scholarship Programme generally starting in August 2018. Kindly submit an advance copy via email at geidd@searca.org. Kunming University of Science and Technology (KUST) has begun the application and admission work for 2018 Scholarship Program. Application deadline: 30th March, 2018. Please find attached some information about application requirement and our catalog of programs (Master’s and Doctoral Degree) in academic year of 2018-2019. Universitas Negeri Yogyakarta Indonesia has offered ninety-three (93) scholarships for qualified students to study for undergraduate & graduate level at Yogyakarta State University. The scholarship is offered for maximum of 60 months period of study for bachelor degree, 36 months period of study for master degree and 48 months period of study for doctor degree, include of Indonesian language course and preparatory program. Application Deadline: 4 May 2018. On-site Interview and Registration for Myanmar, please visit the following link.